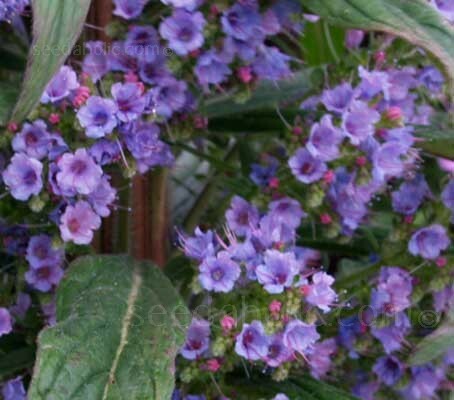 Echium pininana is undeniably an eye stopper, a magnificent inflorescence with dense panicles of deep blue flowers borne above branches of dusty linear leaves, When in bloom, it is a magnet for hummingbirds, bees and butterflies. Echium pininana is native to La Palma where it is a highly threatened species in the mountainous laurel cloud forest. In this country, unlike in its native Canary Isles, 'Blue Steeple' needs to survive two winters before coming into flower. It requires a partially shaded spot and always moist, slightly peaty, yet well drained soil. The rosettes of large leaves are attractive even as a non-flowering plant and the flower spire can reach over 4m (12ft) when grown in mild areas so it is worth waiting for. On a sunny day, as you approach the spire you can hear the hum of hundreds of bees feasting on the flowers. 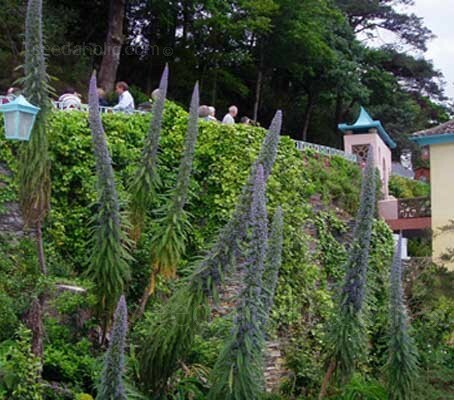 In 2002 Echium pininana was awarded the Royal Horticultural Society’s Award of Garden Merit (AGM). Sowing: Sow in late spring to early summer. Sow 3mm (1/8in) deep in good seed sowing compost from late May-late July. When large enough to handle, transplant the seedlings to 7.5cm (3in) pots and over-winter in a cool greenhouse, conservatory or on a well lit windowsill with a temperature of around 7°C (45°F). Plant out the following spring 1m (3ft) apart, into a sunny site with well drained soil. Be careful when handling this plant and consider using gloves. 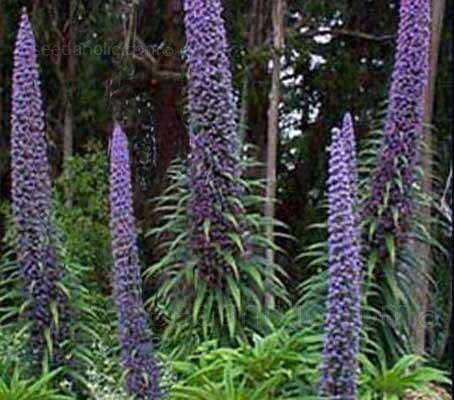 As with most of the Echium family, the leaves have tiny allergenic hairs that may prove an irritant in some sensitive individuals. If a plant is not going to flower, it can be made to branch by cutting the growing tip out with a sharp knife in October. This will create a multi-headed plant which will produce up to 6 flower spikes the following year. Beds and borders, Cottage/Informal, Drought Tolerant, Greenhouse, Low Maintenance, Planted in groups, Sub-Tropical, Wildflower. Echium pininana is native to La Palma where it is a highly threatened species in the mountainous laurel cloud forest. 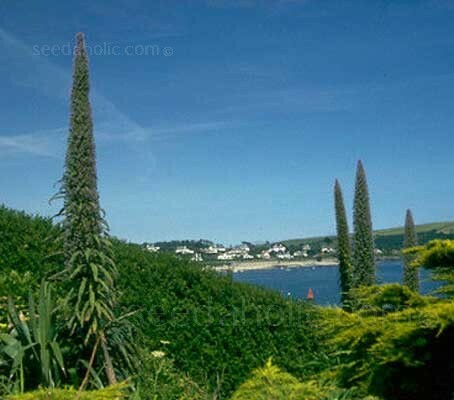 The stately towers of a number of Echium species came to English gardening first in the Scillies, where they slowly colonised the lanes and front gardens near the famous Abbey Gardens on Tresco. Visiting Cornish gardeners fancied growing it, and this spectacular tourist happily jumped to the mainland. Both the species name pininana and the synonym pininifolium come from the botanical description "pinnate" which describes the arrangement of the leaves on either side of the stem. It is occasionally known as Viper’s Bugloss. Officially, the name Viper’s Bugloss is reserved for the plant Echium vulgare. In gardening circles, it is also used for this slightly divergent species.